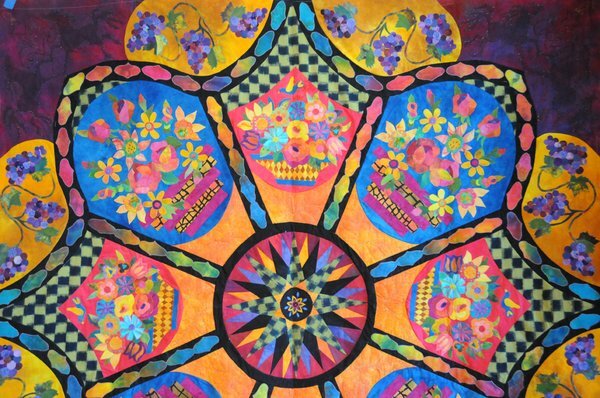 The May 2010 version of the La Veta Quilt Retreat started today. One of the returning students, Marian Pierce, brought a completed quilt top of her original Rhapsody quilt based on a gypsy theme. 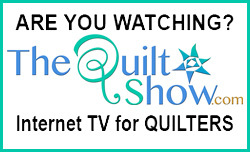 This quilt was started at one of her previous retreats. Note the overall feel that it is a wheel, but the "roof" over the four corner applique baskets are reminiscent of the top of a gypsy wagon. 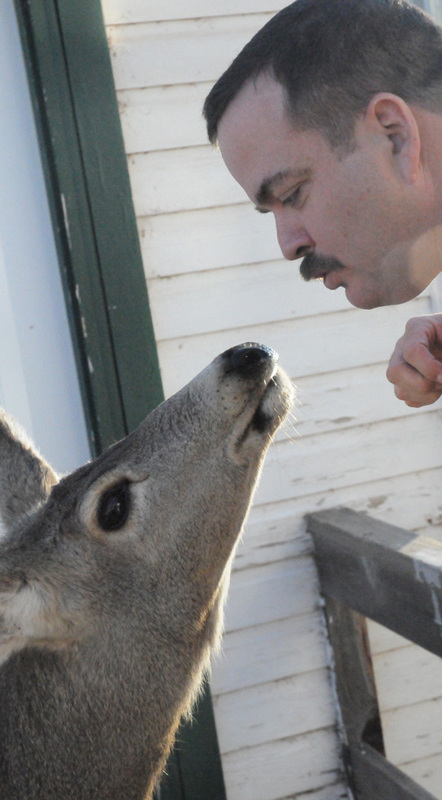 Photo - Justin flirts with one of the town deer. Three days ago, during the wee hours of the night, eight of our tame town deer were senselessly shot and killed. The poacher did not attempt to take them, they were simply left to rot. They were not shot for food or sustenance. The tally included one buck, five doe, and two fawns. I realize that deer can be a problem and nuisance, but I believe we must find ways to live in harmony with nature. The deer were here first. One of the joys of living in La Veta is seeing the deer in town. It's like the scene in the opening of the show "Northern Exposure" where the moose is sauntering through town. Our town deer bed down and look like fake yard ornaments - only these are the real deal. The deer that were shot would not know to run from humans. I could go on, but there is no need. I just felt obligated to pay tribute to them on my blog. 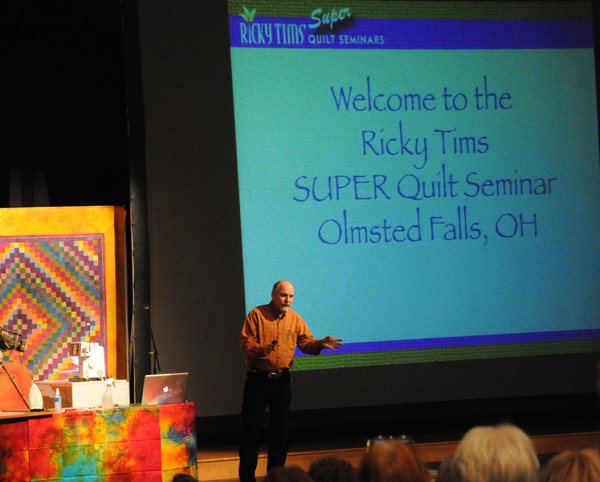 Farewell to those who attended the Ricky Tims Super Quilt Seminar in Olmsted Falls. Each seminar is hard to describe in words, but it is always filled with great enthusiasm and we create memories that will last a lifetime. 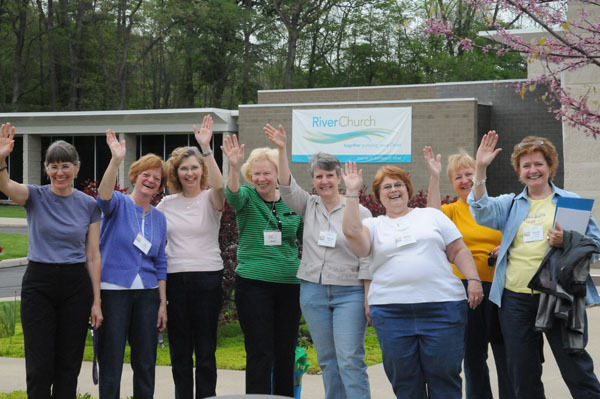 The volunteers from North Coast Needlers provided the much-needed logistical assistance. I snapped this photo from the passenger seat of the die-hard remnants of volunteers that stayed to send us off. 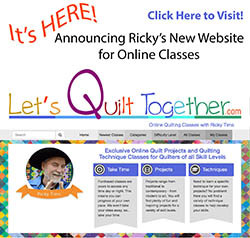 We close another chapter of super quilt seminars and look forward to the next one that will be in Rocklin, CA in June, near Sacramento. 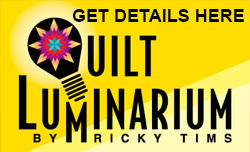 For details click the seminar link. Be sure to watch the video. This is a tribute to my visit to the Rock and Roll Hall of Fame. Everyone has a time that they would call 'the good old days' and we usually have strong associations with the music from those years. Music has a way of taking you back to a time and place where the memories come rushing in. I graduated from high school in 1974 so the music of the 70s takes me back. Here's a list of five of the twenty-two songs I just added to my iPhone today. Can you recall the year they were tops? Do any of these songs take you back in time?